I'm lucky in that my profession has allowed the opportunity to travel throughout the Pacific Northwest, visiting some of the nooks and crannies of Washington and Oregon that I might not otherwise see. Often in these areas I find some of the best food and drink experiences I've had. Recently, Micheal and I spent a week in Ashland, Oregon attending a conference; we played hooky from work for a few days afterwards. One of those days was such a perfect representation of what WestToast is all about, I'm sharing it in it's near entirety as you absolutely want to recreate it at your the earliest possible opportunity. First, some background. Ashland is a city in Jackson County, Oregon, United States, near Interstate 5 and the California border, and located in the south end of the Rogue Valley. It was named after Ashland County, Ohio, point of origin of Abel Helman and other founders, and secondarily for Ashland, Kentucky, where other founders had family connections. It officially became a town with the name Ashland Mills in 1855. As of July 1, 2011, the city had a total population of 20,255. It is the home of Southern Oregon University and the Oregon Shakespeare Festival. Conveniently, Ashland is located in the Rogue Valley American Viticulture Area so there's plenty of wine to go around. Additionally, the Shakespeare Festival brings 400,000 tourists per year to Ashland so there's probably 100 restaurants in the town; every one I ate at was simply outstanding. Oh yea, everything in Ashland is "historic", so be sure to add the word to your vocabulary prior to hitting city limits. A block off of the main drag in Ashland, you'll find the gorgeous historic Winchester Inn. Stay here. Billed as the finest lodging in Ashland, I'd have to concur and also add that each room is unique, comfortable as all get out, and the staff are fantastic. Reserve one of the suites and you'll likely end up with a whirlpool tub and fireplace in the room, and you'll be pleasantly surprised each afternoon upon returning to your room to find a house-made pastry treat waiting for you. Each morning, guests are treated to a complimentary European continental breakfast, or, for a $10 up charge a full hot breakfast. The full breakfast is fantastic, but the continental is unlike any free breakfast I've ever gotten. It's for real, folks. The perfect way to start your day in paradise is a little bit of self-care, and Erik, Micheal, and I did so after a long and busy conference. Two block from the Winchester is the historic Waterstone Spa and Salon. You want the spa. A 30-minute foot treatment is incredibly indulgent and cost-effective. Exfoliation...scrubbing...massaging. Rawr! Oh, for all the dudes out there, trust us when we say this is worth it. You really don't know how much abuse your feet take until you give them a little TLC. Step 3 - Cheese, of course. A quick 18 miles from Ashland in the town of Central Point, the next stop is the historic Rogue Creamery. 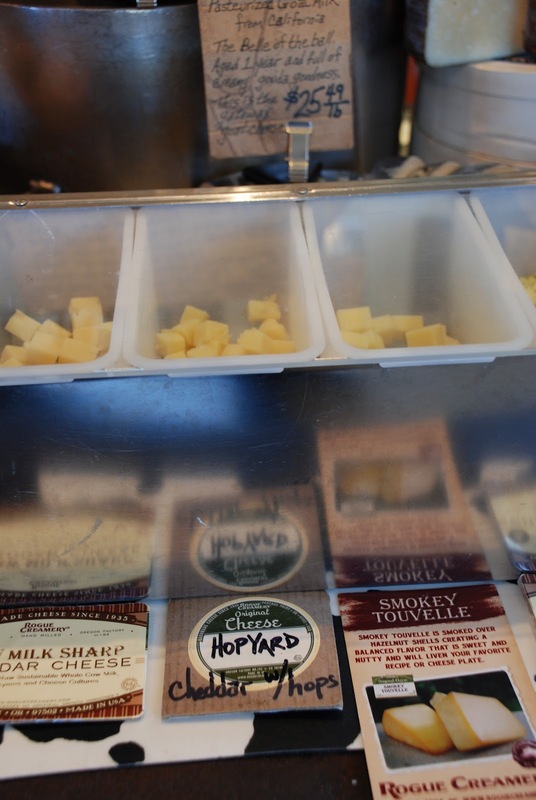 Located inside an unassuming cinderblock building, Rogue is a world-class producer of blue and cheddar cheeses. Cheese? Great. Even better? Unlimited samples. The knowledgable staff will taste anything in the shop for you. Buy cheese here. 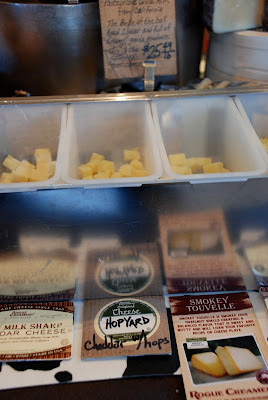 We picked up an aged gouda, a blue, a white cheddar, some cheese curds, a crusty baguette, and some capicolla. If, like us, you didn't plan ahead properly - they have a nice selection of $6 cheese knives so you can cut the cheese. Step 4 - Chocolate, my dear. Conveniently located mere feet from Rogue, historic Lillie Belle Artisan Chocolates is the ultimate in indulgence. Plenty of samples to be had here as well, you'll find a fantastic selection of ganache, bon bons, truffles, bars, chocolate covered bacon, and a passionate chocolatier named Jeff. Buy chocolate here. I picked out 6 pieces ranging from a blueberry bon bon to a chocolate covered pear with ginger, and was pleasantly surprise that Jeff hand-wrapped my selections in a very cute box. Six miles from Central Point is the historic town of Jacksonville. Located in a historic 1865 building in the heart of Jacksonville is South Stage Cellars, Oregon's only vineyard-based wine garden and tasting room. Sashay into the tasting room, go through their flight, and select a bottle for purchase. We fell in love with the 2009 South Stage Cellars Grenache. Take your bottle, cheese, and chocolate out back into the wine garden and have a feast fit for kings. Seriously. It was a rare sunny day for us in February and the nice folks at South Stage even provided plates and napkins for us. The perfect lunch picnic. I don't need to teach you how to do that, do I? Back in Ashland and ready to put some closure on the day, the historic Standing Stone Brewery is a family owned full-service brewpub offering craft beer and delicious food. I had a nice burger with an oak-aged barley wine. Delicious. Standing Stone apparently also has a thing for bikes, as evidenced by the cool shirt I picked up. Bikes and beer? I'm in.